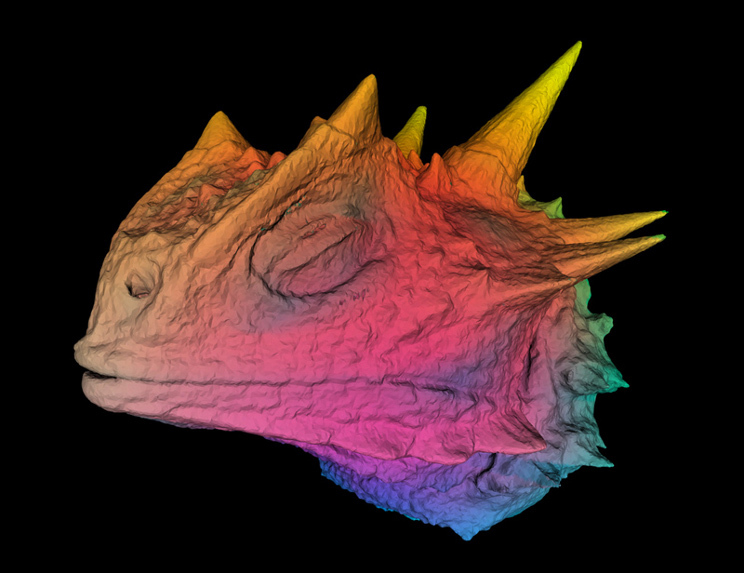 Texas horned lizard with false color using three different color attributes from x-ray CT. Research by Dr. Wendy Hodges and Reuben Reyes. 3D model and visualization by Reuben Reyes at The University of Texas ACES Visualization Laboratory . 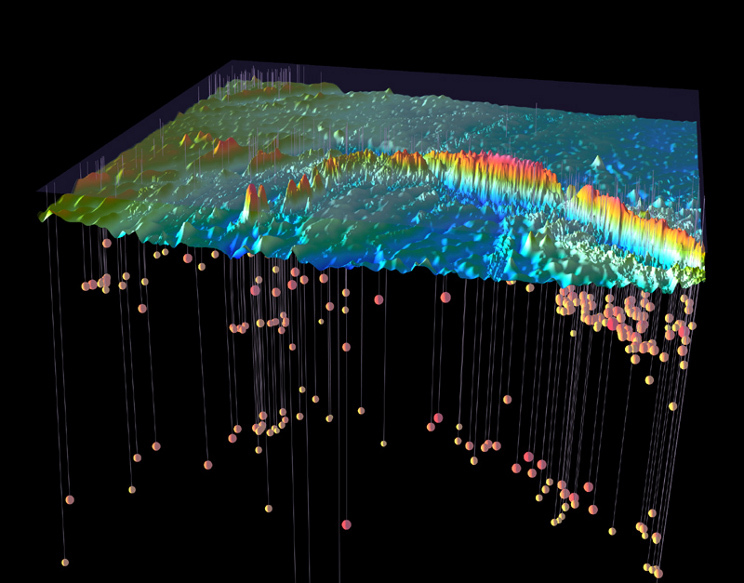 Macquarie Ridge complex bathymetry from side scanning sonar with earthquake hypocenters below. Research by Dr. Tip Meckel and Reuben Reyes at the ACES Visualization Laboratory. 3D model and visualization by Reuben Reyes. Texas Subsurface at 300 degrees Fahrenheit from ~30,000 well logs. Research at Bureau of Economic Geology, GRIDS Research Group by Bruce Cutright, Harold Rogers, and Reuben Reyes. Isosurface and visualization by Reuben Reyes. 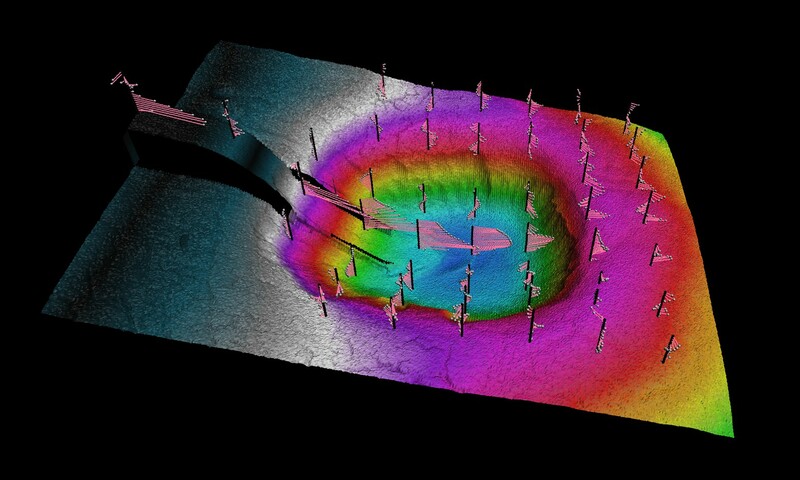 Probability map on surface of Zacaton sinkhole derived from DepthX sonar point cloud. Research by Dr. Marcus O. Gary and Reuben Reyes from The University of Texas at Austin. Visualization by Reuben Reyes. 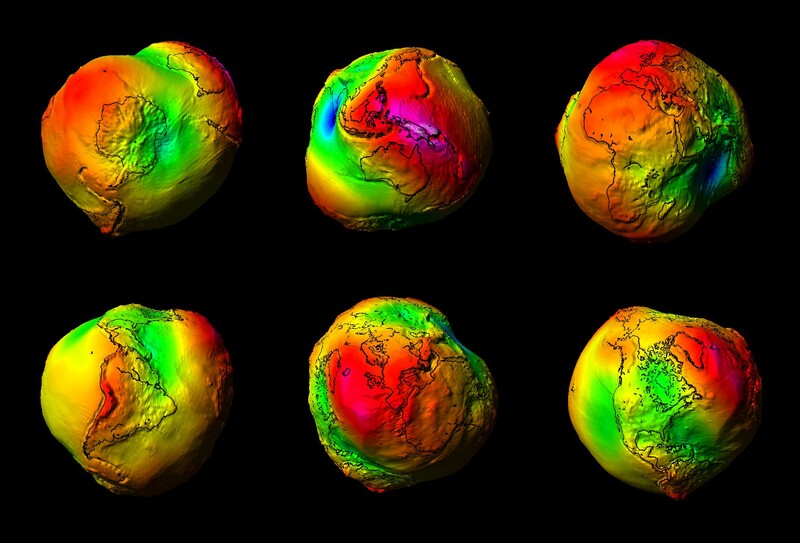 Lumpy Earth from GRACE data gravity field. Research at The University of Texas at Austin Center for Space Research by Dr. Byron D. Tapley. Concept and design of 3D model, and Visualization by Dossym Nurmukhanov and Reuben Reyes at the ACES Visualization Laboratory. 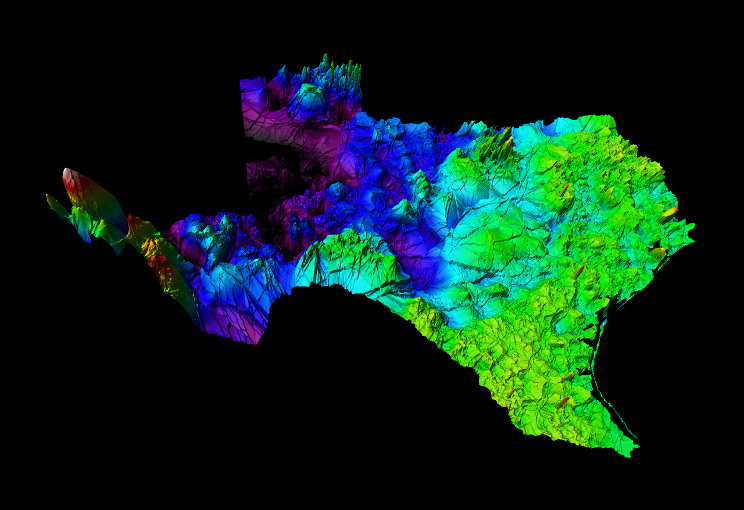 98 million LiDAR points with color (natural and hyperspectral) of the Franklin Mountains. Research at Bureau of Economic Geology Reservoir Characterization Research Laboratory by Dr. Jerome Bellian and Reuben Reyes. Point cloud processing, geometry/image fusion and visualization by Reuben Reyes. 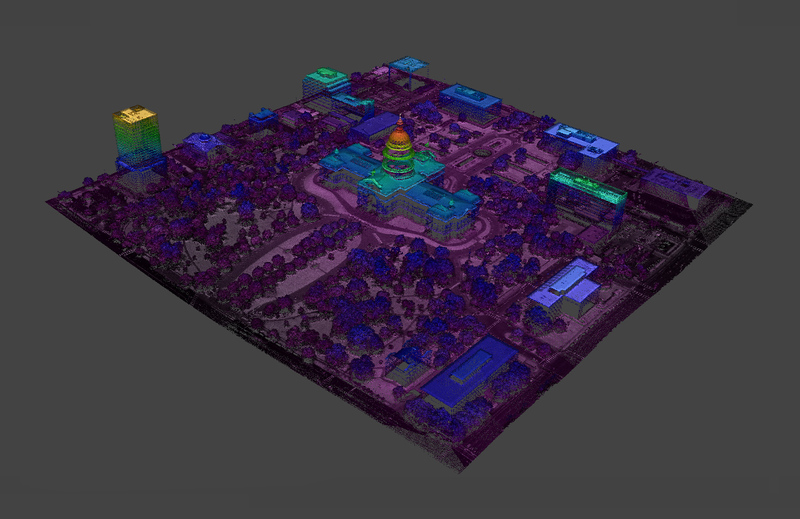 2012 Texas State Capitol Point Cloud aerial LiDAR and geometry fusion. Data collection by Aaron Averett and Kutalmis Saylam from the Near Surface Observatory at The University of Texas at Austin. LiDAR colorization, geometry fusion, and visualization by Reuben Reyes. 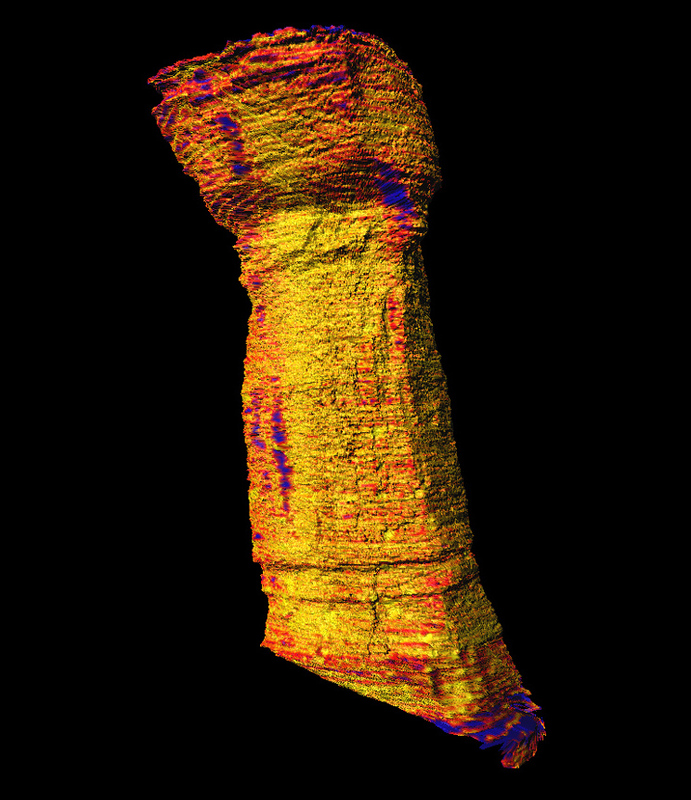 Point cloud of Mars Hebes Chasma with natural color and elevation color ramp scale from NASA's Mars Global Surveyor and image from ESA/DLR/FU Berlin (G. Neukum). Research at Bureau of Economic Geology Applied Geodynamics Laboratory by Dr. Tim Dooley. Point cloud processing, geometry/image fusion and visualization by Reuben Reyes. Time-averaged velocity vectors of a turbidity currents. Research conducted at The University of Texas at Austin Morphodynamics laboratory by Dr. Vishal Maharaj and Reuben Reyes. 3D model and visualization by Reuben Reyes.